Earth is a Balanced Land – Shadow Magic and Light Magic interweave to form a world where magic is known of, but not well. Most of the population figures that magic is some form of technological trick – a misconception the Council of Nine encourages. Earth is also the meeting place for the other Lands – the Shadow Lands and the Dawn Lands both have enclaves scattered about its surface, keeping all the Lands in Balance. Shadow Lords, Earth Lords and Dawn Lords – all work to keep the Balance steady. Or that’s the rumor. In actuality, the Shadow Lord Andreas is working to disrupt the Balance, shift it towards him so that all the Lands fall into Shadow, giving him more power than anyone ever imagined. However, the Starchild stands poised to take it all away – to stand against her, he and the Dawn Lord Kymara are attempting to breed super soldiers, an army of Shadow-born warriors that will lead him to victory. But something goes wrong. The experiments are destroyed, and the first set of his soldiers disappears into the darkness, carried in the wombs of the two breeders they had. Now, twenty-three years later, Andreas is set to try again, with new breeders and a new companion by his side. And yet, once again, there are those who have come to stop him, most notably Nikki Jeffries, a young woman with a shadowed past and an uncertain future. Now the clock is ticking. If Nikki and her friends cannot stop Andreas from completing his experiments, the Council of Nine and the Starchild will have no choice but to reset the Balance utterly, wiping out everything and starting anew. But with the rumor running that the Four Horsemen have already been summoned and unleashed on the Earth, will they have time to stop him, before chaos envelops them all? Growing up in a household filled with books, it's only reasonable that Valerie Griswold-Ford had her first novel penned at the tender age of 7. Since then, she's graduated to the real world of writing: now, at age 30, she has five years of journalism under her belt, as well as a chapter in The Complete Guide to Writing Fantasy. 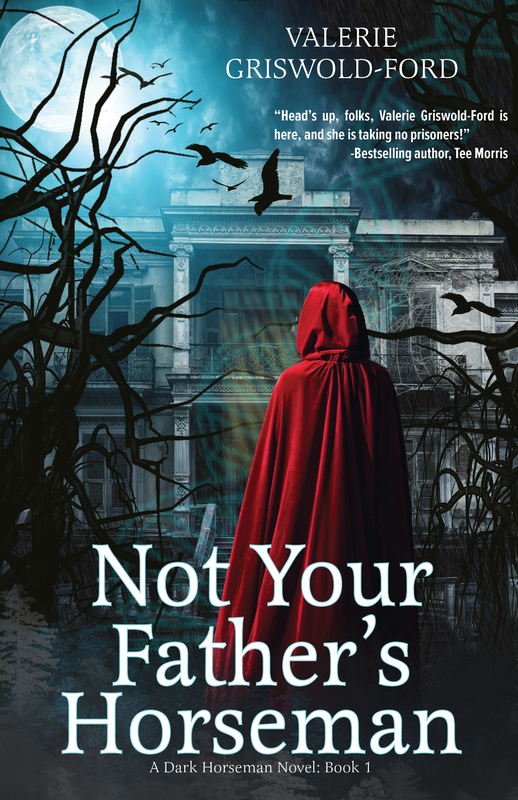 The Fantasy Writer's Companion is her first co-editing position, and her debut novel Not Your Father's Horseman, a dark fantasy take on the Four Horsemen of the Apocalypse, is due out from Dragon Moon Press in July 2005. Val lives in Merrimack, NH with her husband and their psychotic Siamese Max.